A few weeks ago I described foundationless frames built with vertical bamboo supports. In a related post on starter strips I explained that I was going to compare homemade (dipped) wax strips with simple wooden strips or laths, the latter made from tongue depressors. Here’s an update on the progress the bees have made with these frames so far. This trial wasn’t properly scientific, it was poorly controlled, it was conducted over several weeks in two apiaries with bees from a variety of sources. As a scientific study it was deeply, deeply flawed. I know a bit about these things. You have been warned. Caveat emptor. Essentially I could see no difference in the acceptance rate (effectively the rate at which bees started comb) between the three types of starter strips tested. These were homemade wax strips or wood (tongue depressors) strips glued to the top bar with adhesive and either left bare or coated with molten wax. Some of the frames I’ve been using even had one of each of these types of starter strips in each of the three ‘panels’ (see below) on the frames. Frames like these were used in hives with packages or shook swarms and were readily accepted by the bees and rapidly drawn out (either with a good flow of nectar from the OSR, or 1:1 syrup made up from leftover fondant). By the time I went to check all three ‘segments’ were started in the hives. I didn’t monitor which was the first to be used … I’d have needed to be inspecting hourly and I have a life (and job and family). As far as I could tell there appeared to be no preference to the type of starter strip used. Of the 20-30 frames like this used so far this season, all have remained attached during inspections, whether started on wood or wax. I’m reasonably careful handling frames, but I reckon these could cope with all but the most cack-handed beekeeper. Colonies in the bee shed have been exposed to temperatures in the mid-high 30’s (°C for overseas readers) with no adverse effects, other than the expected softening of comb at high temperatures. Conclusion – since the outcome was indistinguishable there seems no reason not to use simple unwaxed wooden strips as starter strips in foundationless frames. The KISS principle† applies here. There are two or three additional benefits from the observation that simple wooden laths are perfectly acceptable as starter strips; 1) there’s no need to go through the interminable and messy process of making your own wax starter strips, 2) there are no foundation costs involved‡, 3) the frames can be recycled through a steam wax extractor without damaging them. Foundationless frames built with vertical 4mm bamboo skewers are easy and inexpensive to construct. I’ve used about 50 of these already this season with almost no problems. The bees usually avoid the vertical skewers until the comb is nearly completely built. Often this is well after the queen has started laying in the upper section of the frame or the bees start to store honey in the upper cells. It’s not until the frames are well occupied with brood or nectar that the vertical gaps on either side of the bamboo skewers are usually filled in§. Until then the comb is only attached at the underside of the top bar. This is a potential weakness … until the comb is completed there is little lateral support or stability. Handling the frames, particularly in hot weather, requires some care. I found myself going through the same frame handling methods I was taught several years ago – turn through 90°, rotate around the top bar, turn back through 90° etc. to inspect the other side of the (now inverted) frame. Re-reading that it still doesn’t sound quite correct, but anyone who has attended a winter training course for new beekeepers will be familiar with what I’m talking about. Once the gaps are filled the comb is pretty robust and can be (mis)handled with the usual amount of care used for comb built on wired foundation. In addition, you can smile smugly to yourself as the woodwork was probably built from second quality frame partsΔ, there were no foundation costs involved and the wax is clean and untainted by residues. One of the striking features of hives containing a significant amount of foundationless frames is that the bees draw significantly more drone comb than is usually found. 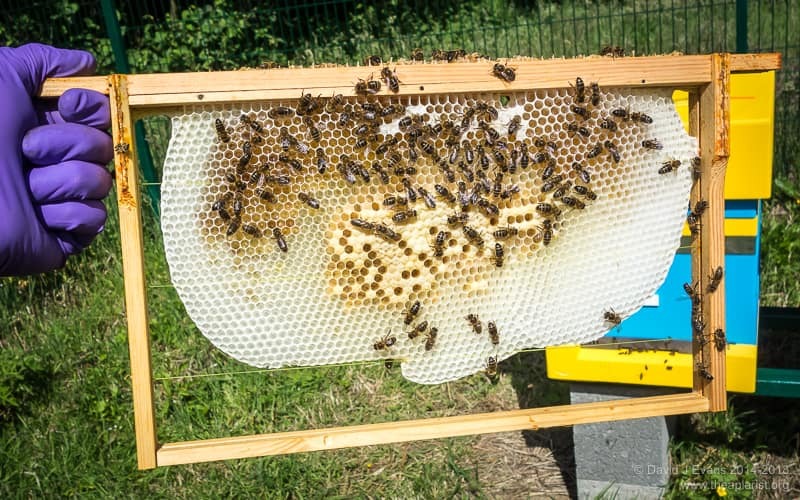 On standard foundation the bees squeeze drone comb into the corners of the frames, often making the comb uneven and misshapen. On foundationless frames they draw lots more, but the comb is generally not as misshapen. If you use horizontally wired foundationless frames there will be large swathes of the comb dedicated to rearing drones. This may be intermixed with worker comb. In contrast, frames built with vertical bamboo skewers tend to be drawn in thirds … with each third being ‘dedicated’ to either (or largely) worker or drone brood. In the ‘Foundationless triptych …’ image above the left and central panel are largely worker comb, with the right being drone. In the image below the left and right panels start as worker but soon transition to all drone comb, the central panel is worker. I see this as a very significant advantage of this type of foundationless frame. Since the demarcation between drone and worker brood is pretty clear and since there are no wires to be cut, it will be a simple task to excise the unwanted segment (whether drone or worker) as required. We do this type of manipulation all the time when harvesting brood from our research colonies and the bees rapidly rebuild the damage if there is a nectar flow. It does not seem to result in weirdly shaped brace comb appearing throughout the hive. Conclusion – bamboo skewers make good supports for foundationless brood frames. Before being completely drawn the frames need to be treated a little more gently than those with horizontal (wire or monofilament) supports which are more rapidly incorporated into comb. In my view the robustness and ease of construction using bamboo skewers outweighs this transitory lack of support. † The KISS principle (keep it simple, stupid) dates back to the early 1960’s. It was originally a naval design term and was an expression meaning that most systems work better if they are kept simple rather than being made more complicated. Simplicity was therefore the design goal and unnecessary complexity was to be avoided. ‡ As a comparison, 1000 tongue depressors cost about £17 delivered. This is sufficient for well over 300 frames that are usable in perpetuity, or at least as long as the joints remain intact. In parallel to frames made with homemade foundation I have also used another 20-30 with commercial foundation. These worked as well, or badly, as any of the other starter strips used. § It’s interesting (to me at least) that vertical 4mm supports are avoided whereas horizontal 1mm monofilament is readily incorporated – for example, compare the image on the right with those above. Is it the thickness or the orientation that makes them acceptable? How would the bees cope with very thin vertical supports? Alternatively, would they readily build comb ‘down’ through 4mm horizontal bamboo skewers? The latter is tricky to test as the longest skewers I’ve been able to find (35cm) are too short for a National frame. However, the ability to more willingly incorporate a thinner vertical supports can easily be tested and will be something I may well investigate next season. I suspect it’s the thickness of the ‘barrier’ rather than the orientation that’s important. Very thin wooden skewers would be flimsy (even if they were available), but there are a variety of other materials that could be tested. Δ In my experience, other than a few poorly placed knots, second-quality frames are perfectly acceptable for building foundationless frames. One of their few failings, at least from some purchased from Thorne’s, is that the foundation channels in the side bars are sometimes off centre. Obviously, this is of no relevance when preparing foundationless frames. This entry was posted in Beekeeping, DIY, Frames and tagged drone comb, foundationless frames, KISS, tongue depressor on June 23, 2017 by David. It has been the year of the swarm here in the Limousin, after a winter when I had little time to prepare for the season so was caught short of everything … The bamboo and foundation strip sounded like a great idea and has been put into use for both brood and super frames with what looks like excellent results on both. It will be interesting to see, in due course, how the shallows stand up to extraction. 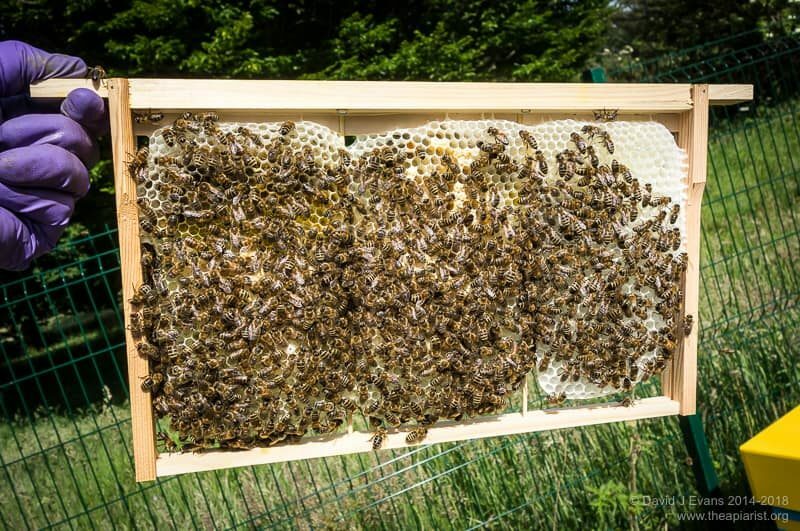 I hived a swarm yesterday which, if I could have weighted it, would probably have been well over 3kg, very late for us and hopefully the last, as the only equipment left empty is an old Dartington hive, lacking frames, tucked away somewhere in the barn. I may have to resort to Ted Hooper’s recommendations on surplus swarms! The sweet chestnut is just coming in to flower here so as long as the thunderstorms keep away we shall see a good month of honey flow before coming to what is, for us, the end of the honey producing year until the ivy kicks in. Really enjoy the posts. Thank you. Randy at HoneyBeeSuite calculated that there are 7000-8000 bees per kilogram so your recent swarm is about half the size of a National colony at peak season. Much better than something the size of a small grapefruit. Swarming here looks like it’s also over, though I have some residual interest in a couple of bait hives. I’ll be interested to hear how you get on extracting from bamboo’d foundationless frames. I’ve yet to try any of these in supers, though I have extracted from monofilament-supported foundationless frames successfully. I currently have excess supers so haven’t had to build any frames for them recently. I hope the sweet chestnut yields well. The bramble is going over here but things should pick up in the next fortnight or so. Of course, we also have the heather to look forward to in August/September. I love your articles…I was introduced to your blog on through a local listserv I am a part of. You do the experiments that I would love to run, as soon as my little apiary hits a critical mass. 🙂 This is my 2d year as a beek, and this year, I seem to have run into more than my share of problems… even so, Onward. Pleased you enjoy the posts Julia. I’ve spent most of my life doing experiments. My beekeeping ones are a bit amateur in comparison, but no less enjoyable. I think it’s important to evidence decisions that are made. Beekeeping is a very traditional pastime, with some practices firmly based on hopelessly dated evidence (or perhaps no evidence at all). It’s only by asking – and answering – questions that we can make progress, improving things for our bees and our beekeeping. Good luck with the rest of your 2nd year. It gets easier as you get more experience. I think this is my 10th year and there are lots of things I’m still learning (or re-learning having forgotten them at least once already). I just cut a sheet of foundation in half and put that in. More secure than a starter strip as you always have the “loops” of metal wire at the top or bottom of the foundation sheet to lock the foundation in with your nails. It also encourages them to start drawing it out in the normal vertical direction. They then neatly fill the bottom half of the frame with lovely natural comb. Perhaps the simplest option, but there may be disadvantages. I alternate half-foundation frames with full foundation frames. Just joking. What you describe clearly works well. However, the attachment to the top bar never appears to be the problem. I don’t think the wires provide any significant level of additional security other than stopping the gimp pins from tearing through the foundation. 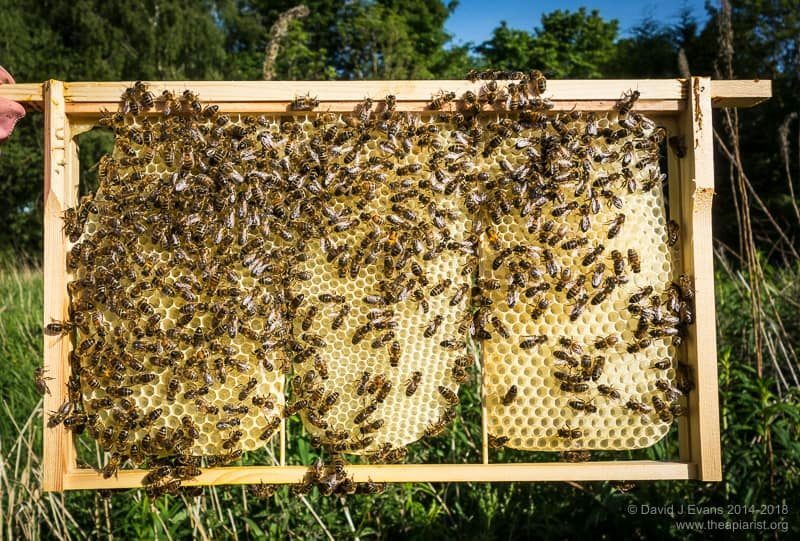 Once the bees work the wax the comb is attached sufficiently well for any of the usual frame manipulations – including extraction. I do use pins when using full sheets of foundation. For wax starter strips then melted wax is just as secure. However, the ‘tongue depressor’ wooden laths are used just as well by the bees and – since they’re permanently fixed with adhesive – are never going to come loose. Hi, I copied your idea and put foundationless frames in. This makes the frames difficult to remove without tearing the wax and rolling the bees. I am assuming that I can trim off the bulges and return the combs when I extract. Not really my idea Sean … there are many others who were using these sorts of frames long before I was even beekeeping. All I’ve done is discussed what I’ve tried. I’ve had pretty good success getting the bees to draw foundationless frames reasonably straight and true. Comb is built vertically down. It’s therefore important that the hive is level perpendicular to the top bars of the frames (I think that’s the correct way to describe it … the top bars of adjacent frames need to at the same level). Secondly, the bees do well if they’re helped by alternating foundationless with drawn frames. I often add them into the expanding broodnest adjacent to the stores or pollen frames. The bees readily accept them and soon draw them out nice and straight. It sounds like you might have used them in super frames (from your comment ‘when I extract’). Once empty of honey you can certainly level these off. 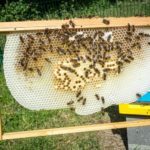 I space my super frames quite widely where possible to maximise honey to wax ratio … I start with 11 frames in the super and reduce it as the comb is drawn out to 10, then 9. Sometimes the bees draw these unevenly as you describe. After extraction you can simply run a sharp serrated breadknife along the face of the frame to make them level again. Pleased you enjoyed the post. Having good results from using frames with foundation wires only. Started with a pattern similar to that in foundation and now using 2 vertical wires. 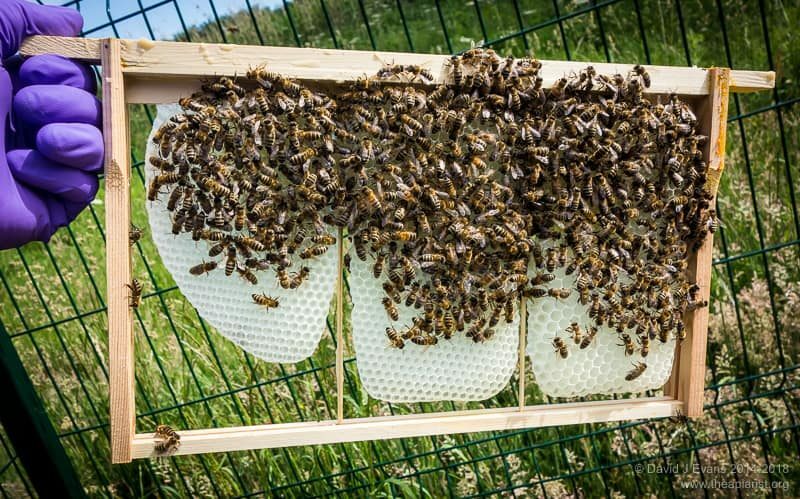 This is only stable when the comb reaches the bottom so care is needed but no more than the bees deserve. The bees are this year building a large amount of drone comb.they know best, which I assume will become stores comb in the winter and this is more usually to the side rather than the bottom of the frame. The Queen is very quick to lay in this comb which is good. Very satisfied with the results. Since your original article 18 months or so ago I have had a year using one horizontal frame wire just below I/2 way down the frame and lolly sticks in the top covering the middle 2/3rds of it. The results are very good, quick and cheap to make up and as you would expect the bees love it. I can see no excessive drone comb in these but last year there seemed to be a lot more drone in all hives. The comb is fairly stable when it is drawn to the wire but I usually find that there is no need for more than a quick glance until the wax is down to the bottom. I still take care when inspecting but no more than I usually do. One single drawback, and this was caused by a swarm that went into an empty hive, The wax was linking frames near the entrance (curtaining) in a few frames. I am fairly sure that this was caused by the air movement inside the hive as the wax ‘flowed’ into the hive from a reduced entrance and would have given very good air circulation. Inconvenient to start but a large knife to separate the frames once the wax was strong enough and then a vertical cut through the flaps to realign it on each frame solved the problem. Usually I put a couple of unwired frames between a previously drawn one to alleviate this or a dummy board for them to draw up to. This year I am putting dummy boards into the empty hives to stop it happening again on the off chance that I get a swarm in the first days or May but not complaining, this swarm built up a brood and a half plus one and a half supers of honey on top. My bait hives have a single frame of old comb in them. Inevitably they start there and then start drawing comb on adjacent frames. I’ve only had problems when the hive wasn’t level. However, I usually manage to check my bait hives a couple of times a week, and then usually move them to a quarantine location where I treat them, sort the box out and ensure all is OK with them. Won’t your dummy board reduce the effective internal volume when the scout bees size up the space?? 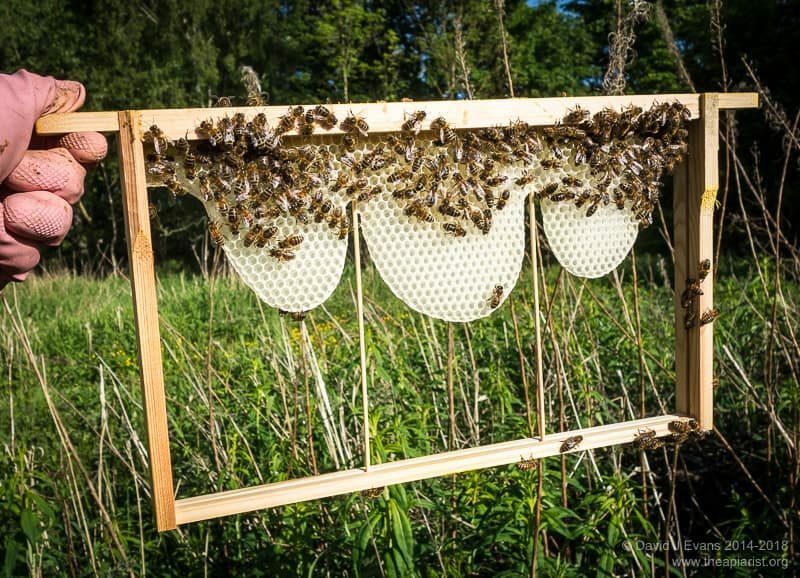 Usually I have no problems in bait hives but once they are in I would move the drawn comb to the middle which usually gives me straight (manageable) comb. In the hives I usually put them in after the bees are in their hive and have yet to find the best spacing for them ie. 1 or 2 frames from the last drawn comb. The real problem I had was when an early swarm entered an empty hive with lots of room for air movement and they had drawn about 4 frames from nothing in the week or two before I found them in early May last year. I was too late to do anything early on so I left them till after the harvest. For the record, most of the other frames away from the entrance were fairly straight without intervention. I’ve had swarms move into stacks of supers with drawn drone foundation … what a mess. This and the mite levels in some swarms mean I try and deal with them as soon as I can after they arrive. Fascinating post as usual , David. Interesting to hear that in Fife the swarming season is almost over and the bramble is going over. Well here at the opposite end of the UK, in sunny Sussex, the warm weather seems to have started a mega flow from the bramble such that a well known supplier had run out of wired foundation earlier this week. I have now used all my supers and we are still in June. And only today a swarm that I collected six weeks ago,and then united with a nuc a couple of weeks ago, has swarmed again, on open queen cells. Just when I thought everything was under control! Moving North solved my super-shortage problem. I also discovered a dozen flat-packed ones bought in the Thorne’s sales one year when unpacking, so have some more spares if needed. You can extract from foundationless frames – at least using a radial extractor – and several friend simply ‘crush and melt’ the honey out, so a foundation-shortage shouldn’t be a problem. Having said the bramble is going over I was out walking yesterday and there are a few patches still in full flower being hammered by bumble and honey bees. There’s a lot of genetic diversity in brambles and I’m assuming these are later-flowering variants. Finally, although it looks as though the swarming season is now finished, what d’you bet that my apiary check this afternoon turns up a couple of colonies with charged queen cells? The lime trees are just poised to flower here in South London so I’m expecting my whole crop to arrive in the next 2 weeks. Though with the number of swarms and splits I’ve had this year none of the colonies are up to full strength. It would be interesting if we could plot honey flow timing on a map somehow to see how quickly it changes with location. Colonies here (mine at least) are looking pretty good. The problem is that the only flow is incessant rain 🙁 It’s been the wettest June on record in parts of Fife. This means there’s little foraging and many colonies need feeding. Interesting thought re. plotting nectar flows. It might be easier to plot the flowering of particular forage (and other easily identifiable) plants as whether or not they yield can vary according to the weather. It would inevitably be complicated by farmers growing different strains with early or late flowering periods. However, it would give a pretty good indication of how the season was progressing year on year. One of the online forums (fora?) has a thread titled Limewatch which might be of interest. 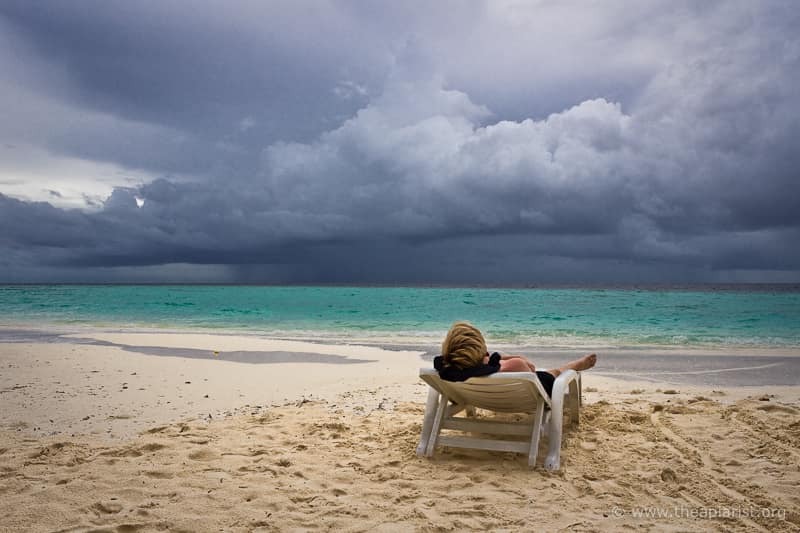 absolutely love the blog … .wonder if I can still get a response on this old article >? Can I ask for more details about the bamboo strips you mentioned. Can I just use old chopsticks ? or what do you do ? More details are here … not sure why I didn’t link this from the ‘update’ page. Chopsticks are probably too fat. If you look around you can also find long skewers for horizontal supports … I’m trying some of these this year as well. YouTube? … not a chance … ‘a good face for radio’ as my friends tell me (often).